In January, I shared news on the Planning Board’s proposed Article to help the Town become a “Tree City”. This month, Planning’s Chair presented the plan to the Board of Selectmen. Pitched that the program comes with no new costs or regulations, selectmen support the initiative. It’s worth noting that while becoming a Tree City doesn’t appear to have a downside, Article 28 doesn’t require the Town to achieve or maintain the status. Passing it is just one of the steps needed to get it. If all of the criteria are met, the Town can apply. If the Town is named a Tree City, it would need to confirm meeting the requirements each year in order to keep the designation. The Planning Chair told selectmen that he hopes the designation will encourage non-profits and developers in Town to embrace the mission by contributing trees and “greening up” the town. He told the board that there are currently 87 in the state including following near us: Westborough, Marlborough, Framingham, Grafton, Natick, and Weston. Morris said encouraging planting is part of his board’s efforts as they plan for the Town’s 300th year in 2027. * They previously hired a consultant to identify where trees can be safely planted on public land and what kinds. In addition, anyone who gets permission from the Tree Warden can plant a tree out of the public way which will count towards the program. As for the eligibilty criteria, the Town already meets two of the four. #1 is having a department or board. The Town has a Tree Warden and occasionally brings in an arborist. According to Morris, that passes muster. Morris told the board that the Town Planner is willing to to draft the proclamation for selectmen. If necessary, she can also take on the responsibility of applying for the status and maintaining documents to renew each year. Arbor Day falls on the last Friday in April, which is right around the time that the Town celebrates Earth Day. (Earth Day is April 22nd. Southborough usually holds a clean up event on the following Saturday.) The Town holds an annual Clean Up Day through partnership between the DPW and the Rotary Club. 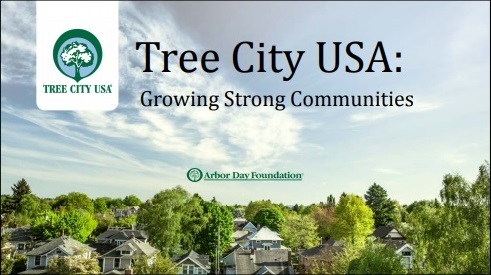 In recent years, they have added activities honoring Arbor Day as part of the celebration. *Editor’s Note: Planning isn’t the only group thinking about trees in relation to the tricentennial. In 2016 shared that the Historical Society was planning an effort to repopulate a heritage tree. They hope for their initiative to bear fruit by Heritage Day 2027. Stay tuned for more on a related grafting class in early April. What effect is that going to have on the trees on Main St. near Fay School and Parkervillr Rd. marked with a BIG orange R? I’m guessing they’re slated for removal. How long will it take a sapling planted this spring to achieve the maturity/size of those trees marked for destruction? 50 years? 100 years? 200 years? Unfortunately, it takes decades for a tree to reach maturity. Are those R trees making way for a sidewalk – that will be moved from its present location (south side) to the other (north side) of Main St.? In my opinion, all the charm of our downtown is and will go out the window, along with the trees, due to the skewed and pushy vision of fee based professionals lining up their next fee.